Extract zip file to a separate folder. Run (double click) dreamset.exe file. Press Setup button to configure connection(s) for your Satellite Receiver(s). Fill the 'Configuration Tilte', usefull only when you have more than one Satellite Receiver or a multiboot setup exists. Fill the 'Box IP', write an IP or a domain name like DynDns names. Fill the 'User name', in most cases is root. Fill the 'Password', type the default firmware password unless you have change it. 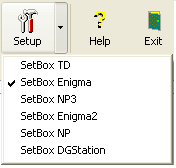 Select firmware type, for example for DM7000/DM7020 is Enigma 109, for DM7025 is Enigma 2 etc. Press 'Check Configuration' button to check your configuration, when all parameters are correct no error message is appeared. Press 'Save Configuration' button to store configuration changes. Press 'Ok' button to close the setup dialog and to store all changes you made in one or more configurations. Select as firmware the last option 'Custom' then you can change all values. Satellites.xml type the path where the file 'Satellites.xml' exists on box. Services,Bouquets: type the path where the settings (services, lists) are stored on box. Telnet Usage: here you can set when Dreamset will use a telnet command to reload settings, only for Enigma1 and Enigma2. Dreamset first tries to reload settings using HTTP reload command, if this fail (the box does not respond) Dreamset ask the user whether or not wish to reload settings using telnet command in order to reload the settings. Dreamset first tries to reload settings using HTTP reload command, if this fail (the box does not respond) Dreamset sends a telnet command in order to reload the settings. Dreamset never use the telnet command even if HTTP reload command failed. Dreamset never send the HTTP command, always sends a telnet command in order to reload the settings. 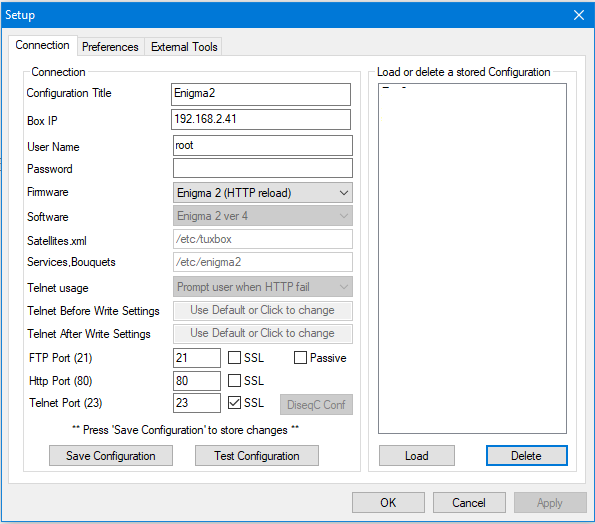 Note, some images for E1 and E2 accept the http reload command but they do not reload the settings and the user do not see the changes he made. Dreamset cannot detect this malfunction. In such cases you must prefer the last option "Always use telnet command"
When more than one configurations exist you can switch to another one by pressing the small arrow at right hand side of 'Setup' button. A list with all available configurations appears, select a configuration to be the active. The active configuration is displayed at status bar. Tranfer (read/write) settings by pressing transfer button. Dreamset uses the active box configuration.